City Council on Monday approved plans to renovate the second floor of the City Hall Annex building, left, for use as additional city office space. The former home of The Delaware Gazette, the annex building will be accessible from Delaware City Hall, right, via a second floor connector bridge that will cost an estimated $285,000 to construct. 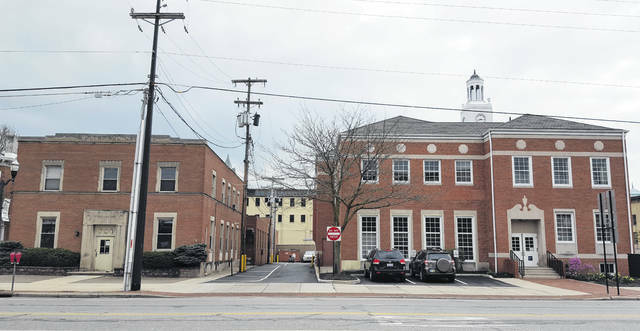 Delaware City Council approved appropriations Monday to finalize plans for the renovation of the second floor of the City Hall Annex, formerly the Gazette building, located at 18 E. William St.
Plans are to renovate the second floor for additional office space for city use. According to Assistant City Manager Jackie Walker, the renovations will include matching the second-floor windows with those on the first floor, updating all mechanicals, cleaning the entire exterior, and some tuckpointing in only the much-needed areas. A connector bridge will also be constructed that will conjoin the two buildings, which is expected to cost $285,000. In February, the city entered an agreement with COhatch (doing business as Delaware Community Space LLC), to lease the first floor for co-working space. According to founder Matthew Davis, the company will offer as many as 40 offices for small businesses and the general public. He will pay $78,000 annually to rent the space. As outlined in the agreement, the city is responsible for bringing the COhatch space to a “vanilla box” state, meaning the interior will be minimally finished. The combined cost of renovations between the COhatch space and the second floor will be $1,736,286, $615,000 of which has been appropriated for the new City offices on the second floor. The funds will come out of the city’s municipal improvement fee fund. Original estimates for the renovation of the second floor were set at $500,000, but the $115,000 in renovations to the roof had not been factored into the overall cost yet. Walker said Red Architecture, who is doing the work on both the first and second floors, is in the process of updating their cost estimates for completion of the second-floor renovations and the connector bridge due to the spike in steel prices stemming from President Donald Trump’s newly-imposed tariff on steel imports. With the ordinance being declared an emergency, renovations are expected to begin immediately upon finalization of the contract. Walker said the contractor is “biting at the bit to get started,” and is aiming for an “incredibly aggressive” finishing date of Sep. 1. According to the city, no onsite parking will be made available for the contractor and his sub-contractors, and it remains to be seen how downtown parking will be affected by the construction period.